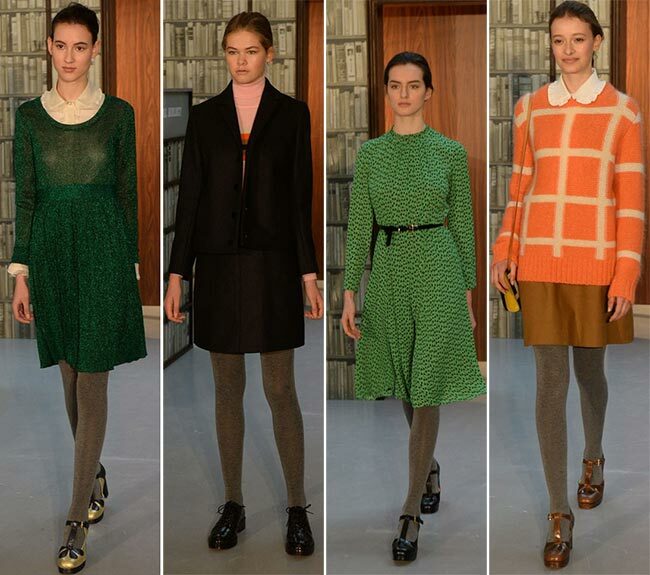 Ali MacGraw pictured the Cambridge’s Radcliffe schoolgirl style in the newest Orla Kiely fall/winter 2015-2016 collection that was showcased in the library on the second day of London Fashion Week fall 2015. Both the atmosphere created and the clothing showcased came drenched in a lovely Seventies style harmoniously mixed and matched with Sixties mini silhouettes for retro cuteness overload. 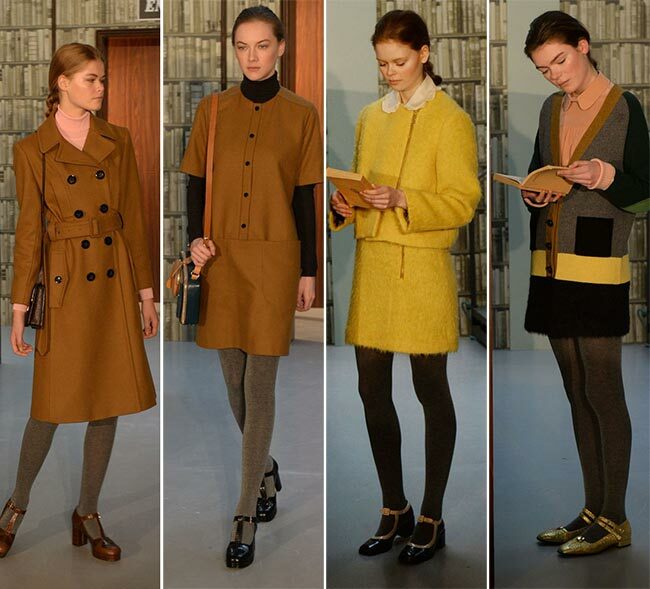 That was a comfy, cozy and easy-to-wear collection of retro chic attire options meant for the modest librarian girl, who loves bundling up in warm knits and perfectly tailored outerwear options spiced up with Mary Janes and creative handbags. She wears her hair in laidback braids and keeps her face fresh devoid of any makeup, looking young and girlish. 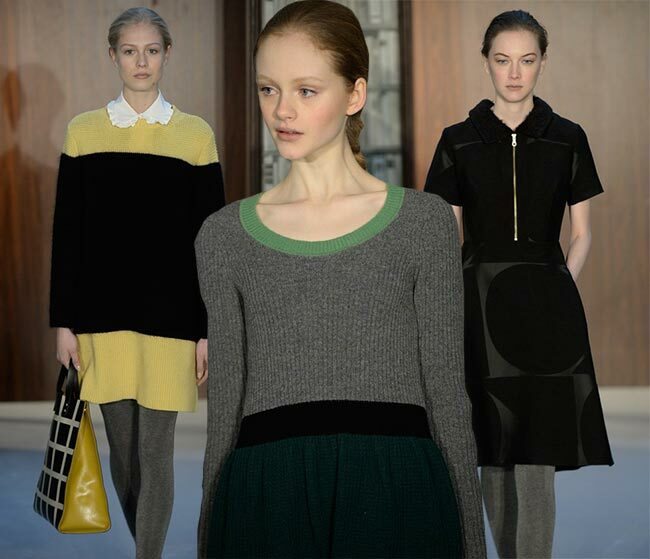 It’s the distinctive cheerful patterns, colors and retro silhouettes that have us enchanted every time we see a new Orla Kiely collection and that’s absolutely no exception about this newest selection of autumn-ready pieces ideal for casual everyday wear. 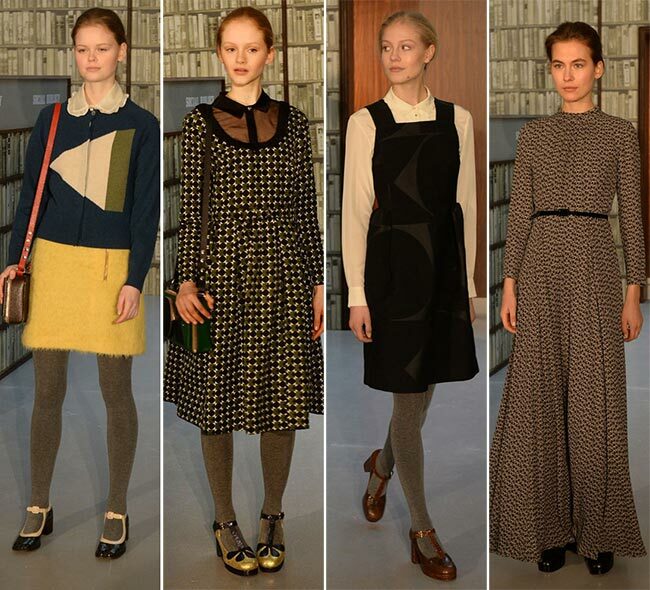 There are no evening gowns and cocktail dresses showcased here, and we have enough of such pieces in all the other fall 2015 fashion lines unveiled, but what makes the latest Orla Kiely designs so outstanding and lovely is the functionality, wearability and comfort that they provide to the wearer. After all, we all strive to look and feel self-confident and comfortable in our day-to-day attire options, especially when it’s winter and we have to take the cold season factor into consideration. The overall color palette screams Seventies, bringing shades of muted browns, yellows, grays and blacks, as well as deep greens, chestnuts, bright oranges and peach hues that add a bright and zingy touch to the entire collection. We have lots of color-blocked and geometric patterns inspired by graph paper, which come to break the monotony of the monochrome looks. The lengths showcased are diverse from mini to below-the-knee cuts, while in terms of the styles we see mainly girly and feminine dresses and skirts with just two or three pairs of printed tailored pants making an appearance. There are lots of Sixties A-line mini skirts and eighties swishing skirts available that are beautifully teamed with chunky knitted and cashmere sweaters in lively colors and prints. The grandma-inspired knitted cardigans add so much warmth to the looks, while the neat coats in different colors and lengths make the outfits even more polished and elegant. In terms of finishing details, we see thick gray tights completing the skirt and dress ensembles, while bags available in different shapes and shades and Mary Jane shoes make the overall Seventies mood even more dazzling. Yet another collection unveiled proves that we are going to enjoy the stylish Seventies era for an entire season to come and we are more than happy about that!